WhatsApp is one of the most popular instant messenger applications. They have already announced that they would publish locked audio recording feature recently. Developers have released it today at beta version of the application. (04.05.2018) There were also a few surprises with the new update of the application. Users will no longer need to push and hold the microphone icon with this new feature. We will able to use this feature after a short time later. You will need to tap on the microphone again but you can swipe up your finger and lock audio recording feature. So you can leave your finger from the screen of your device and record your audio freely. When you are done with recording, all you have to do is tap on the send icon. Your friend is going to receive your voice message soon! WhatsApp also announced that they will release another feature at incoming updates. You will able to listen recorded audios before you send them first. So you will decide to send or cancel it. It will be quite user friendly because you can check if you have recorded something wrong. The feature is in beta test yet but developers are expecting this feature to be fully released on Android very soon. 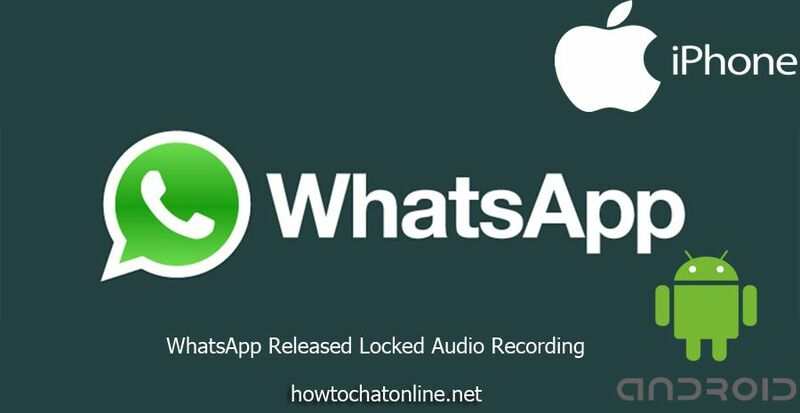 WhatsApp Locked Audio is in the beta test at the moment. However WhatsApp hasn’t announced that they will release this feature for iPhone and iPad users yer. It is also unknown that there is any such a work for iOS devices. However we believe that developers are going to provide this service for iOS devices too after they have fully release it on Android. You can track How to Chat Online to get most recent news about Android and Google Play Store. Hello, this is awesome but when it will be available. I am using voice messaging much and yes, holding finger makes things harder for me. Can I use beta version the app? If the answer is yes, how?